MOLLIE MAKES, BLOGGING. MAG REVIEW. 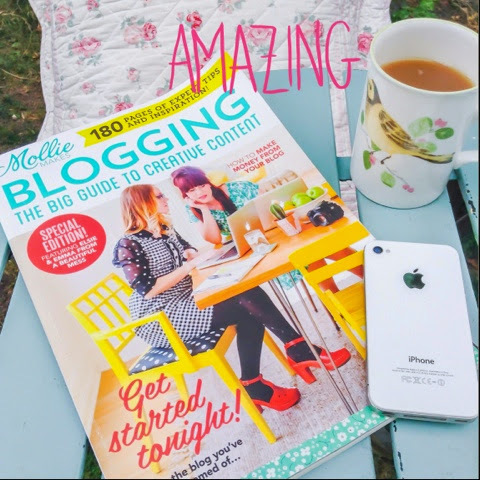 I came across this mag through one of my blogger/Instagram pals and thought I'd check it out. I must admit, the £9.99 price tag did make me wince a bit but I kind of figured it was just like buying a nice book! A little bit about me... I started 'the vintage good life' blog about three yrs ago, give or take. After briefly looking at the platforms available I opted for Blogspot. It's been a flexible platform for me to learn and tweak, and my first blog posts were about anything and everything. I've had a brief flit over to wordpress and back again, and I also have a tumblr account. My style has developed over this time and I feel I would like a bit more from my blog, hence my new mag. One word... WOW! If you're wanting to start a blog, lost your way blogging or just need to understand it better, then go and buy this mag. Now! I loved the interviews with bloggers and designers, and every page was inspiring. I loved the snippets of workshops, and found the section on 'the perfect host' very useful. Ginny Soskey gave a great breakdown of the platforms available, a real need to know! It covers everything from creating great content, planing your posts, and taking pics, to using and linking other media such as Instagram and Twitter, plus how to make money from your blog. I think this mag is well worth the investment. It's left me feeling inspired and focused. I know exactly my next move, what I want from my blog and I'm comfortable I've found my mojo, and now know how to make the most of it! Watch this space! Thank you Mollie Makes for producing another fab read! It's been an eye opener!